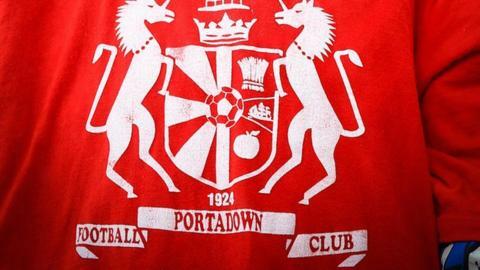 Portadown are to appeal a £10,000 fine and signing ban after they were found guilty of two offences in relation to undisclosed payments to players. The Irish FA has banned the club from signing players on a new professional contract until 1 June, 2017. Portadown said it was appealing "on the grounds that the evidence we supplied was sufficient to show that no undisclosed payments were made". "Further evidence to support this stance will be supplied." The IFA's Disciplinary Committee ruled that £5,000 should be payable within 14 days and £5,000 suspended until 1 June, 2017. The club avoided a points deduction or automatic demotion from the top flight. A statement released by the IFA indicated that "in light of the evidence presented, the committee found two matters proven". Portadown have endured a troubled season, with long-standing manager Ronnie McFall stepping down from his position last month after 29 years in charge. The club lie in a lowly ninth place in the Premiership, just five points above basement side Warrenpoint Town and four points ahead of Carrick Rangers, who are in the relegation play-off spot.